The precious metal dropped during yesterday's session after US trade representative Robert Lighthizer said issues with China were "too serious" to be resolved by promises of more purchases of US goods by Beijing, raising uncertainty over a potential trade deal between the two sides. He also added in his testimony that any deal with China must include a way to ensure commitments are met and it was too early to predict the outcome of ongoing trade talks. 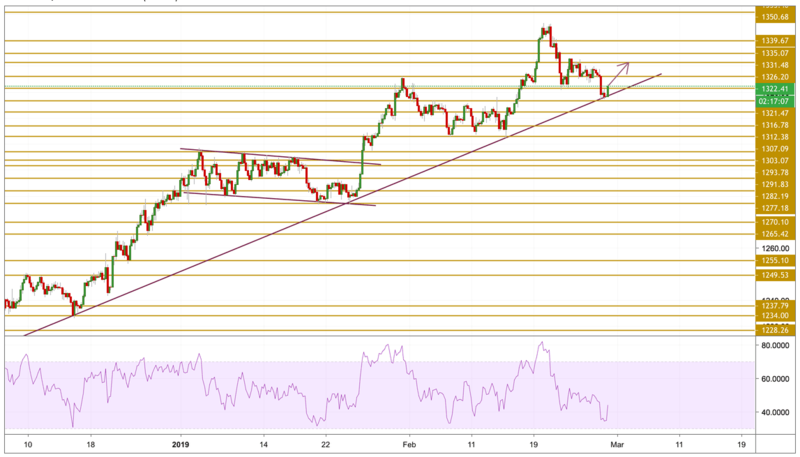 Despite all the uncertainties surrounding different geopolitical tensions, the yellow metal faced pressure in what it appears to be a technical move. As expected, Gold prices plunged towards the $1316.70 support level during yesterday's session after failing to hold above the $1326.20 level. Having met with the long term support trend line presented on the chart, the price has bounced back up and looks ready to test back the major uptrend. We will be focusing on the $1330 level.